Red, brown, green, black…lentil varieties abound, and so do their usefulness in recipes. In general, each tablespoon of cooked lentils provides about 1 gram of protein and 1 gram of fiber, and a 1/2 cup of cooked lentils gives about 3.3 milligrams of iron. Lentils are a good source of phosphorus, potassium and folate too. Green lentils work especially well in stir-fries, pasta sauces, baked recipes, granola bars, burger patties, slow cooker recipes and in shepherd’s pie! A low-fat nutrient rich pulse that can be easily prepared and used in many dishes. Measure a cup of dry uncooked green lentils into a pot. Rinse the green lentils once or twice in cold water and fill up the pot halfway until all the lentils are covered. Let the lentils soak overnight (due to water absorption, the lentils will expand slightly). The next day, drain out the remaining water from the pot, and rinse the lentils once or twice in cold water. Do this by filling up the pot halfway, stirring the lentils around and then pouring out the excess water. Add 2 cups of fresh cold water to the pot and then place the pot uncovered on the stovetop on a medium heat setting. Once the pot contents start to boil gently, place the lid on the pot (leaving a small opening slit) and let the pot contents continue to simmer for 25-30 minutes. Adjust the stove heat setting as needed to keep the pot contents bubbling gently. Taste the lentils after 25-30 minutes of cooking to determine if you need to continue to cook them another 5-10 minutes longer. When done, at least half of the green lentils will be soft and some may have the halves opened slightly. Some of the lentils may be still a bit crunchy, but this is fine as the lentils will be cooked further in other recipes. Use a slotted spoon to remove the cooked green lentils into a separate bowl to cool (reserve the cooking liquid to be used in other dishes). Reserve the rich green colored lentil cooking liquid as this makes a great vegetable broth base for other dishes (this keeps in the fridge for a few days). Note that one cup of green lentils makes a lot of cooked lentils (3 cups), so you can really get your money’s worth from a bag of dry green lentils at the grocery store. Look in the dry produce aisles of your local grocery store, superstore or ethnic stores to find green lentils marketed alongside other dried beans and pulses. 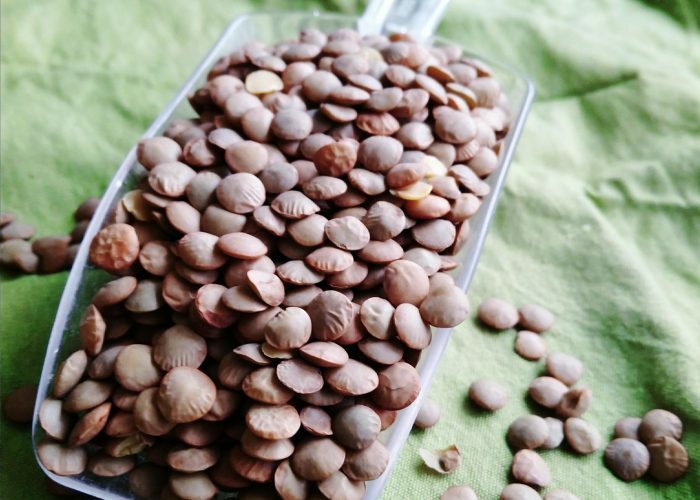 Any leftover cooked green lentils can be stored in the refrigerator for a few days, to be used in different recipes. Some recipes call for using the uncooked green lentils, so be sure to check the recipe before cooking them. Cooked green lentils also freeze well in the freezer so you can make extra and just freeze a portion to take out later and thaw to use in another dish. If you are in a rush and don’t have time to cook green lentils, you can also get canned green lentils from the supermarket, which work just as well as cooked green lentils in recipes. Just be sure to rinse and drain them well before using!